Janet Yellen might have the most powerful job in the world, as the Federal Reserve (Fed) she now chairs controls what may be the world’s most powerful printing press. We take a closer look at what her reign might mean for investors’ portfolios. 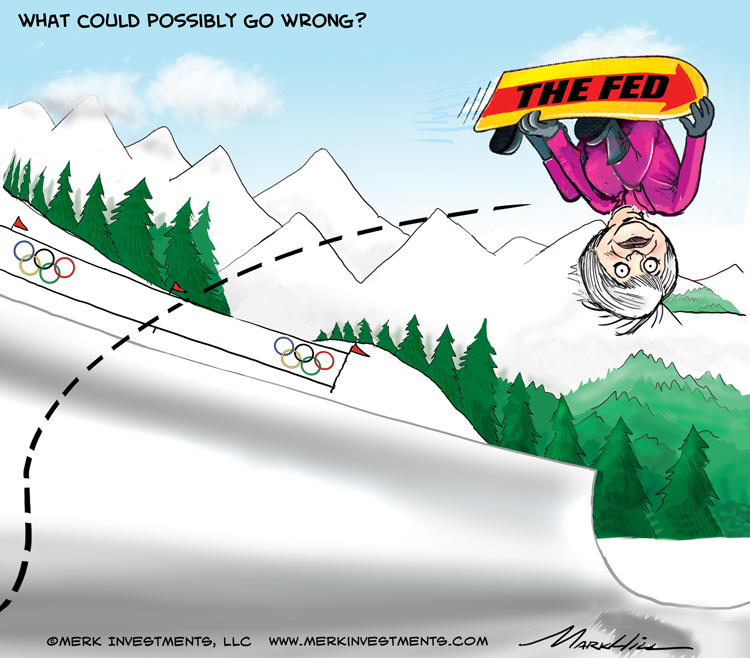 Yellen’s half pipe dream: hope is not a strategy? Serving on the Federal Open Market Committee (FOMC) in 2008 as President of the Federal Reserve Bank of San Francisco, Janet Yellen has been praised for grasping the severity of the financial crisis early on. Leaving aside that 2008 was a little late to prepare for the crisis, let’s try to find out what type of central banker Yellen is. There’s the dreamer: back in 2003, the then head of the European Central Bank (ECB) said: “We hope and pray that the global adjustment process will be slow and gradual” – this served as the catalyst for us to re-engineer our investment advisory business: if central bankers revert to hopes and prayers, so I thought, it’s time for investors to take precautions. The “global adjustment process” is a codename for the U.S. current account deficit; the “slow and gradual” is a thinly veiled reference to a possible U.S. dollar crash. There’s the ivory tower academic. Ben Bernanke, in turn, was a student of the Great Depression. He had a guiding philosophy: when faced with a credit bust, forcefully deploy monetary policy to reflate the economy. On various occasions, he emphasized that raising rates too early during the Great Depression was one of the biggest policy mistakes of the time. Our interpretation: the Fed all but promises to be late in raising rates, wants to err on the side of inflation. That’s because, according to our interpretation of Bernanke’s philosophy, taking the foot of the accelerator too early may cause deflationary forces to take over, undoing any “progress.” We call it an ivory tower academic view as the theory does not take into account the side effects, namely other bubbles that might be created along the way; we further think the theory is altogether broken, as we believe monetary policy affects prices, but does not generate wealth. During Yellen’s confirmation hearings in late 2013 to become Fed Chair, she stated the Fed might return to a more normal monetary policy when the economy is back to normal. We have pointed out that this is an oxymoron, as we don’t think the economy can return back to normal when the Fed meddles with the price discovery process and the process of efficient capital allocation. Janet Yellen is a labor economist and has taken keen interest in looking at unemployment numbers at a deeper level than headline unemployment numbers reported. During Yellen’s testimony to the House of Representatives this month, she consulted with colleagues when asked what the definition of a part-time employee is according to the number of hours worked. Given that different definitions are used by the Department of Labor and, for example, what is used in the Affordable Care Act, Ms. Yellen should be excused for consulting with colleagues when grilled by Congress and under oath; however, given that her home turf is the labor market, her hesitation did raise some eyebrows. Janet Yellen is on record supporting a “modified Taylor rule” in setting monetary policy. Unlike the Taylor rule that defines the level of interest rates based on inflation, Yellen’s preferred metric heavily emphasizes employment. However, during the above-mentioned testimony, she distanced herself from the modified Taylor rule. Yellen argued that a sensible approach requires a qualitative assessment given that the Taylor rule (or a modified Taylor rule) would have required negative nominal interest rates. Merk Senior Economic Advisor and former St. Louis Fed President Bill Poole has pointed out that, according to his recollection, Yellen has never objected to being called a monetary dove. In trying to use a positive word to summarize these observations, let me choose the term “pragmatic.” “Freestyle” may be another way of coining her approach to monetary policy. As her June 2008 comments suggests, however, her forecasts are not always right. And neither would one expect that from any human being. Unfortunately it is fallible human beings controlling the printing presses of the world. When they make mistakes, it may have major implications. It’s one reason why we believe printing trillions may not be prudent, because there just might be unintended consequences. Of course no physical currency has been printed, but virtual currency is created literally with the stroke of a keyboard when the Fed buys Treasuries or Mortgage-Backed Securities (MBS). Here’s the problem with a “freestyle” approach: the market doesn’t like uncertainty. It’s not aided by the fact that the Fed itself may be flying blind. That’s because the Fed is manipulating its own gauges to assess the health of the economy. By buying Treasury securities throughout the yield curve (short-term, as well as long-term Treasuries), the Fed is looking itself in the mirror. Instead, the Fed has to look at backward looking indicators, i.e. read the tealeaves on unemployment numbers. That lack of certainty, the lack of predictable leadership is fertile ground for volatility. Yellen’s freestyle approach hazardous to Emerging Markets? As we discussed in more depth in a recent Merk Insight, weak Emerging Markets might be the biggest victim of Yellen’s freestyle approach. Lacking the liquidity of developed markets, an uptick in volatility may cause investors to run for a small exit. We have seen much of that unfold since last spring when the Fed “taper” talk first flared up. In a nutshell, countries that had major inflows of money when the Fed’s policies were highly expansionary, but had few investment opportunities, saw a bidding up of local government securities. As the tide appears to have turned, it’s comparatively easy to sell these securities – except, of course, that these markets aren’t all that liquid to begin with, so any selling may cause significant headaches to investors. The more advanced emerging markets are far better equipped to handle the volatility, as money was more likely invested in real projects. In our assessment, countries are better off that have features such as a reliable rule of law, a mature banking system, a domestic and offshore fixed income market, sound monetary policy, and a reliable regulatory environment. The more advanced Asian economies have many of these features. Weaker countries like Brazil and South Africa may lose out, however, there may be exceptions among the weaker players. We are more positive on India, notably because of ongoing structural reform and comparatively low asset prices. A country worth mentioning is China: the volatility of its currency, while still low compared to that of free floating major currencies, has spiked, causing some hot money to run for the hills. However, the increased volatility is very much in line with the goals of China’s foreign exchange regulator. Increased exchange rate volatility encourages the market to find an equilibrium rate at which there are buyers for every seller and sellers for every buying, among non-central bank participants. For the roadmap that China’s regulator has laid out, please read the December interview with Yi Gang, Deputy Governor of the People’s Bank of China and administrator of the State Administration of Foreign Exchange (SAFE). Can investors position their portfolio to win a medal? In most events in the winter Olympics, skill and speed appear pre-requisites to win a medal. If skill corresponds to a high beta (risk) investment, anyone aiming at speed better have skill. Now think of Janet Yellen altering your race course, except that she won’t tell you the modifications she is making. To survive such a course, it may be prudent to slow it down a bit. In our assessment, there is too much complacency in the markets (for an in-depth discussion on complacency, please read our February 11, 2014, Merk Insight). The stock market, as well as various economic indicators, very much build on asset price inflation the Fed has engineered. The trouble is that asset price inflation can evaporate rather quickly. The time to take the chips of the table is before, not after a bubble bursts. If Facebook’s acquisition of WhatsApp is not the sign of a bubble, I don’t know what is. Keep in mind, however, the old market adage that markets can stay irrational longer than investors can stay solvent. As such, taking chips off the table may be prudent. Warren Buffett was ridiculed for not investing in tech stocks in the 1990s. Yet, at the end of the day, he did just fine. In our assessment, investing is about finding values, not chasing trends. Those chasing trends are destined to invest at the top, only to lose money when markets correct. With central banks heavily engaged in the markets, asset prices may not reflect fundamentals. That’s the bad news. The good news is that we think our policy makers are reasonably predictable. Even Yellen can be understood – she just may be tougher to read than Bernanke. But studying her and other policy makers might provide clues to help position one’s portfolio. The gold and currency markets may be the purest plays on what we call the “mania of policy makers.” Gold may benefit as policy makers in the U.S. and abroad continue to “kick the can down the road,” and currency investing may allow investors to stay a step ahead of the game in currency wars. To learn more, please register to be notified when we hold a webinar; our upcoming Webinar this Thursday will specifically expand on the question on how to profit from a Yellen Fed. Also don’t miss another Merk Insight by signing up for our newsletter.